Diepsloot is home to many and also the communities we work frequently work in. 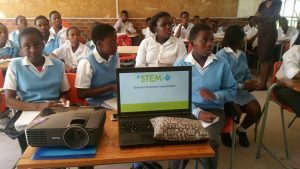 We’ve done a range of activities in this community but this time the P-STEM Foundation visited Diepsloot West Primary School. On the 29th of March 2017 we drove to the north of Johannesburg to have a curriculum intervention in one of our favourite communities. The aim of the day was to educate the learners present about respiration and photosynthesis. The to 2 pairs of grade 8 classes that we saw engaged in a carefully thought out discussion about what they think respiration and photosynthesis is and then what the scientific definition is. After we divided the class into groups the competitive edge made these eager scientists a little more enthusiastic when it comes to learning, especially because there were prizes to be won. The day proved to be an absolute success. The learners were nourished with an almost remedial type of class, during their school hours and they enjoyed it!